Trust the New Year has started in a positive fashion and we are happy to update you on the highlights at the Resort. Plans continue with regard to this year’s 25th anniversary celebration (we commenced operations under the present Management on July 4th 1994) and we will alert you when they become more concrete. A huge Thank you for your support over the years and we look forward to you visiting to your Caribbean paradise many more times in the future. Please check and use the Paradise Beach Villas calendar for your travel dates. Believe it or not we still have members who arrive at the Resort in their wrong week. While we have been able to accommodate them up to now, this is no guarantee so please check to avoid disappointment and possible additional costs. On October 26th, 2018 we christened the uniforms for our adopted baseball team and in the beginning of January 2019 members Le Mont Flanagan and Gary Caruso brought down and donated equipment and “T” shirts to the team which consists of a mix of some kids from last year and new kids. We now have two teams as some of the older kids now are in the 13-14 group. We wish them Good Luck in their games and thank our loyal members who contribute to this noble cause! The Minister of Infrastructure and Planning has imposed a moratorium on accommodation expansion until he and his team have been able to assess each project individually. Consequently, plans for Phase 3 have been put on hold until further notice. It is our pleasure to introduce you to our new Maintenance Manager Leroy Wong. who started on March 5th 2019. He is graduate of the Bushiri Hotel School and his work experience spans overseas stints, the Coastal / Valero refinery locally and most recently, he was a Technical Engineering Supervisor at the Marriott Ocean Club. We warmly welcome Leroy and wish him all the best as he joins our Management team. The Aruban Government continues its drive to make the island more “environmentally conscious” and has mandated phasing out single-use plastic and Styrofoam products in exchange for biodegradable products which are less harmful to the environment. Consequently, in many establishments around the island you will notice a reduction in things like plastic straws and stirrers and more environmentally friendly take-way boxes, coffee cups etc. We applaud the Government for this effort to introduce initiatives to halt the destruction of our environment. We thought we should reminder you that check in time is at 4 p.m. and check out time is at 11 a.m. Housekeeping has a system of priorities which start with the internal room moves. Of course if your room is available earlier we will assign it on arrival but we ask you please to desist from the habit of going on the floors and pressuring / harassing the housekeeping staff into disrupting their routine just to service your room which we notice is slowly creeping into the operation. We understand that you want to get settled as quickly as possible – and so do we – but please adhere to the check in times. As promised, WiFi at the Resort is now free effective January 2019. However, it is password protected so it is only available for resident occupants or bona fide patrons of the Resort – e.g. non-resident food and beverage clients. Please note the Public Holidays for the rest of the year since, although some supermarkets may have very limited opening hours and stores and most shopping venues will be closed for the day. Therefore, please plan accordingly. We are delighted to announce the planned launch of the Happy Community Aruba Along with the involvement of our sister Timeshare Resorts, this plan financially assists the needy in our community via voluntary donations which you can make either from a kiosk in the lobby (using your credit card) or you can agree to a sum to be added to your incidental account at the Resort. The project is still in the developmental stages and we will update you as plans become more concrete. Sincere thanks in advance for whatever you can contribute to this most worthy cause. Related to our community outreach efforts, we also thank you for participating in the “Sharing Is Caring” programme of donations of non-perishable items which are collected every two weeks and distributed to the less fortunate in the community. Masha danki! As the needs of our aging members get more diverse, we advise you of the service offered by Essential Health Supplies, a Company which rents supplies like – crutches, toilet accessories, scooters, wheelchairs and much more – to visitors. They are located across from the Hospital which is close to the Resort, they are available on weekends and they offer complimentary delivery on any rentals. For further details, you can visit their website at essentialaruba.com, email them at info@essentialaruba.com or call them at (297) 587 0940 or (297) 563 0415. Listed on their website, for the convenience of our American members, they also have a US contact number at (786) 245 8093. We have increased entertainment and at the Tiki Tiki Bar, where, every Friday from 5.30 p.m. to 8.00 p.m. we feature Happy Hour with special prices on beer and cocktails, live music and grilled hamburgers and hotdogs. Come and chill with us! Once again the entire Paradise crew express a heart-felt Masha, masha danki to the Winners, Stanbro and Schow families who, for the third consecutive year did a BBQ cook-out for all the employees. The gentlemen cooked and the ladies served a sumptuous meal which consisted of chicken, hotdogs, macaroni salad, a Greek green salad and dessert. The additional surprise this year was a scratch and win lottery ticket for each employee with the possibility of winning Afls 5000. This was their beautifully unique way of expressing their gratitude to the employees for their hard work and it was very well appreciated. Thank you ever so much!! Gestures like this make our work worthwhile and we eagerly look forward to next year. Please let us know if you will be using your week. You have the options of – banking it with the Resort, banking it with Interval International or placing it in the rental programme which can benefit you financially and at the same time fulfill the accommodation need of another member. Internally we can also do some preventative maintenance in the suite …. So PLEASE advise us. It has been a pleasure to update you on the most recent happenings and we look forward to seeing you at the Resort on your next visit. Please be advised of the change to our USA mailing address which is shown below and which takes effect immediately. Please make this change for any payments and correspondence for the Resort. The US Postal Service has advised that for the next six (6) months, any mail sent to the former address will be forwarded to the new address so there is no need for concern. The Watty Vos Boulevard continues around the island. 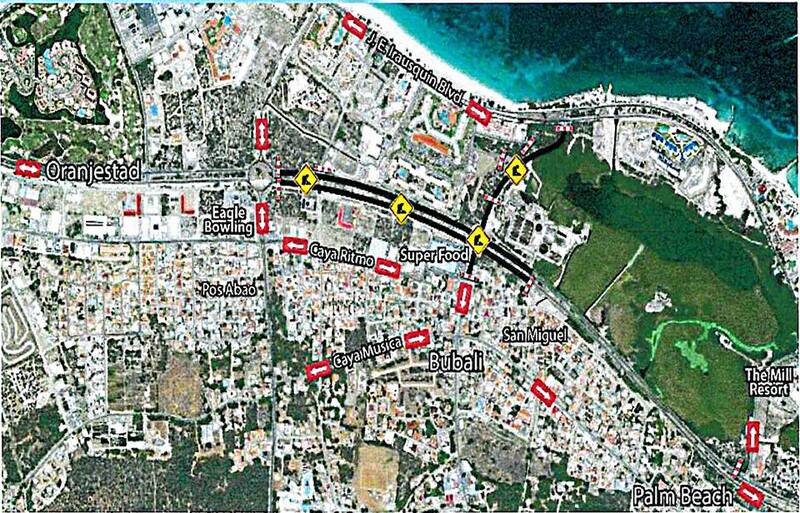 We expect the main beach road – running in front of the Resort – to be affected later this year. We will keep you posted. As a temporary measure, the Government imposed a tax increase of 2.5% effective July 1st 2018. These Government taxes now total 6%. Dredging of the beach on a section of the High Rise (in front of Playa Linda) will begin in June and continue for a few months. This is to keep the ocean in pristine condition and remove plastic and other debris which have built up over a period of time. The Resort received the TripAdvisor Certificate of Excellence for 2018. This is the fourth consecutive year and we thank you for your continued support and the part you have played in us achieving this recognition. We became only the second Resort on the island to have all our employees complete the Aruba Certification Programme. This is an initiative by the Government to have all persons who come into contact with visitors to the island undergo a programme of knowledge training on various island issues – historical, flora and fauna, Constitutional etc. etc.- in order to provide a level of consistency in the facts concerning our island nation. The new laundry building behind the BBQ area is now fully operational. We will be replacing the a/c chiller system of Phase 2. The former Meeting Room space is now shared with a new Sales Office. For your convenience, we have installed a new Ice machine on the third floor of Phase 1 and later we will also place one in Phase 2. We are systematically replacing the thatch on the poolside chickees. We are currently upgrading the outdoor public bathrooms and the renovations will include handicapped and family facilities. This project will be completed by the end of July. The Employees celebrated a family day in June. We continue work on our new website which should be completed shortly. We honored ten (10) employees who were nominated Paradise Stars. This is in recognition of the quality of their work and also their positive work attitude. They were treated to a luncheon at Asi Es Mi Peru along with their Departmental Managers and awarded commemorative certificates. Out of the nominees, three (3) were honored as Shining Stars – Giselle at the Front Desk, Claudio who is at the Towel Hut and Ricardo of Housekeeping. Congrats to them all! Please advise the Resort if you will not be using your week. Remember that all members in good standing received complimentary Interval International membership for a period of two years – effective September 2017 – which expires at the end of August 2019. Update your email address with us. 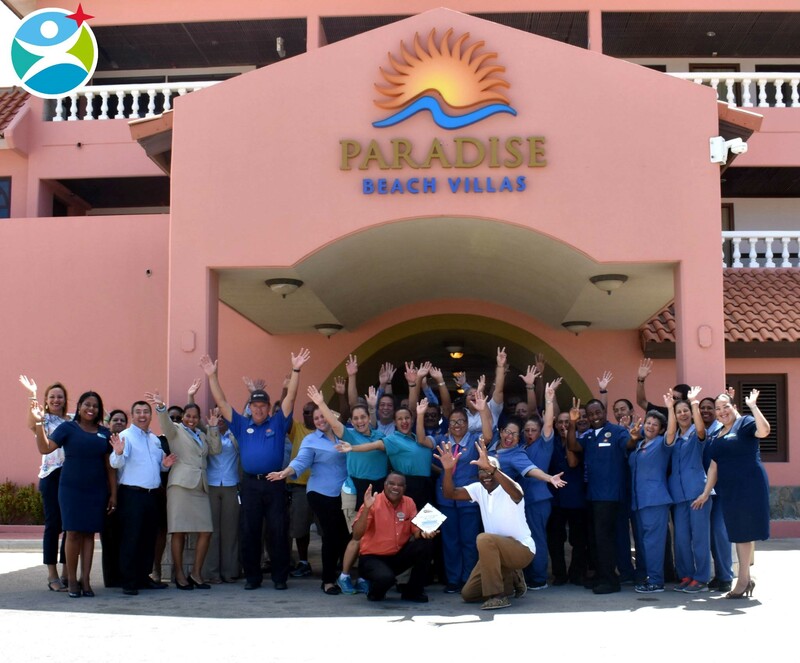 On Thursday, March the 28th, Paradise Beach Villas had its quarterly Staff Meeting. This events are a possibility for the management to bring the staff up to date on all things and decisions that might affect the organization, the employees, our guests, etc. It is also a festive moment, since Paradise gets to celebrate anniversaries at PBV. This time there were 3 Angels that were at the center of the spotlight. In all 3 casess they have been at PBV 20 years already. First up is Jessica Robles de Medina. She is part of the very effective and hard working Accounting Department, run by Freddy Albertus, the co-Managing Director/Financial Controller. Having been here for so long, she has gone through the trials and tribulations of PBV and come out of it shining like a star. Next up, Walter Mohamed, Grounds & Safety Manager, had the honor to introduce the next anniversary and it was none other than the ‘world famous’ Willy Panopio. Walter showed how proud he is of the work that Willy does, every day. Everyone who has been coming to PBV for many years knows the story of Willy and how he has been an integral part of the resurgence of Paradise. Last but not least, Jeanette Kaersenhout, Assistant Manager Housekeeping, introduced one of the gems of Housekeeping: Flor Rodas. Flor is known to be very meticulous in her work. In the meantime Alex Krozendijk, Manager Housekeeping, and Jeanette rely on her to train new colleagues. If these colleagues are able to pass Flor’s intense introduction training, you just know that they are able to live up to the PBV Housekeeping Standard. After he customary placards and closed envelopes were exchanged, there were just some small in-house items to be discussed. After that there were snacks and cake and some soft drinks arranged for everyone, courtesy of the indomitable combo of Jealda Damian, F&B Manager, and Jessica Velazques, Assistant to the F&B Manager, also known as J & J Productions. Everyone enjoyed a few nice hours together. And after the closing of the meeting, what did all the angels went to do? yups, you guessed it: back to work to pamper our Members & Guests. During the years we have mentioned the Watty Vos Boulevard project (WVB), which is a big project to make a new ring around Oranjestad to connect the airport more directly with the hotel area. With this ring they will be circumventing the old road that would take our visitors via the harbor. And anyone who has had to go to or from the hotel to the airport on a day that there are cruise ships in, knows how traffic gets stuck. The project has been started last year. And a part of the project also entails to improve and beatify certain main roads that connect with the WVB. As of today, Thursday, March 1st, 2018, the road between the round-about by Pizza hut and the traffic lights by Superfood, has been closed off. This is to recap the road and to built a big round-about where the traffic lights are at Superfood. the road leading from those lights towards the Eagle Beach Area will also be upgraded. Please keep that in mind when you may want to visit Superfood! The planning is that it will take 3 months to finish this part of the project. As the WVB project goes along, we will keep you updated on its progress. UPDATE: After a LOT of negative comments on,among others, Facebook, the Minister of Infrastructure, Mr Otmar Oduber, decided to delay the closure of the highway between the round-about at Pizza Hut to Superfood. This is due to the difficulties participants to the traffic on the area have encountered. if everything goes well, a definite decision is expected on Monday, March 5th, 2018. We will keep you up to date via our Facebook page. At the beginning of another year, we extend heartiest wishes to you and your loved ones for a blessed, positive and healthy New Year. In Aruba, we were spared the devastating effects of the last season’s hurricanes which severely damaged our sister islands and we wish them a speedy recovery. We completed the lobby renovations and express sincere thanks to our members for their patience during this period. The Tiki Bar and Restaurant has been upgraded as well making it more appealing for our patrons. Asi Es Mi Peru and La Terrazza Italiana have expanded their hours and, in addition to dinner, they are now both open for lunch. The hallways of Phase 1 have been tiled for a fresher look and easier maintenance. In the suites, we started replacing the appliances and the entire Resort will be done by mid-year; fire extinguishers upgraded from 2.5lbs to 5 lbs. and emergency/evacuation signs installed. Smoke detectors have been upgraded around the entire property. We are awaiting formal Government approval for the additional land at the north-western section of our property (on the La Cabana side) after which we intend to beautify the area and create additional parking. To better handle room linens, we are in the process of building a small laundromat for exclusive use by the Housekeeping personnel. The washers, dryers and the laundry detergent dispensers in the laundromats in both Phase 1 and Phase 2 now use tokens only (no quarters). Tokens are available at the Front Desk. We continue the phased change of the thatch to the palapas on the pool deck. We said au revoir to Ed Loor who relocated to Canada in November and welcomed Randolph Berry as his replacement in the Sales Department. We wish them both well in their new career changes. The exchange agreement with Interval International (I.I.) has been extended and part of the new agreement offers a complimentary 2-year membership to ALL members of Paradise Beach Villas who did not already have an I.I. membership. (This offer expires on September 1st 2019). With this new benefit in mind, why lose your week when you have already paid the maintenance fee and your week is in a very desirable destination? At least 60 days before your week starts, call Interval International at 1 800 621 1884 or (305) 666 1884 or visit them online at www.intervalworld.com to deposit for your future enjoyment. In the general elections held in September, Aruba experienced a change of Government and the new Ministers are in the process of settling into their various portfolios. The old unsightly Bushiri Hotel, which has been vacant for a number of years has been finally demolished. We will keep you posted as to the new designation of that area. Construction of the Watty Vos Boulevard is in full swing and, when finally operational, this will significantly alleviate traffic on the main highways on the island. Please advise the resort if you will NOT be using your week. Remember you can also deposit it with Interval International for your future use as mentioned above. Please advise the Resort of any change to your email address so you can be contacted easily when necessary. We encourage you to visit our Paradise Beach Villas Facebook page for frequent updates related to the happenings at the Resort. If you want to bank, upgrade or switch weeks with the Resort, please contact our Reservations Department directly via email at reservation@paradisebeach.aw. Once again, Happy New Year and we look forward to greeting you on your next visit to Paradise! As mentioned in previous posts, we had our new Year Celebration today, on Friday, December 29th, 2017. As part of that celebration we had lighted a pagara. The honors this year went to Mr Randolph Berry. Enjoy the video of the pagara.